says "Dhadak Hindi Movie is an official remake of hit Marathi film Sairaat starring Shahid Kapoor’s brother Ishaan Khatter and Sridevi’s daughter Janhvi Kapoor." to get instant updates about 'Janhvi Kapoor' on your MyPage. Meet other similar minded people. Its Free! 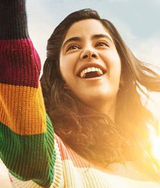 janhvi kapoor says "Dhadak Hindi Movie is an official remake of hit Marathi film Sairaat starring Shahid Kapoorâs brother Ishaan Khatter and Srideviâs daughter Janhvi Kapoor."